This month the Cultural Synergist is having a slight change of format. Rather than our regular article, I decided that we would provide you with some links to listen to a podcast (or two). In the past month I have been interviewed by James Carbary, of the B2B Growth Podcast and Andy Kaufman, of People and Projects. B2B Growth podcasts are predominantly committed to helping B2B sales executives grow their organisations, provide business development strategies, improve partnerships, support effective prospecting and improve negotiation techniques. My interview ‘International growth: How to overcome 3 common challenges’ (Episode 38) explores why we should consider international growth and some unique approaches to overcoming common challenges that organisations experience when embarking on international expansion. People and Projects podcasts are a great resource for those leading people in project teams and delivering projects, with a focus on the intersection of people and projects. In my interview 'How to Tell Someone They Have Body Odor (and Other Tricky Culture Situations)' we discuss the importance of cultural intelligence, including some scenarios and strategies for engaging in difficult conversations. The focus is on virtual teams and leaders who are managing and working in global and culturally diverse teams. If you enjoyed the podcasts and found them of value, I encourage you to write a comment. Listen to one of the most recent CQ for Global Leaders podcast 'Culture is Biased'. As an executive coach, one of Goldsmiths specialities is helping people change their behaviour. The premise of this book is that our reactions to people and situations are usually the result of unappreciated triggers in our environment that lures us into behaving in ways that are diametrically opposed to the person we think we are. Trigger → Impulse → Behavior. 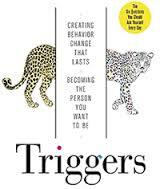 'Triggers' demonstrates how we can overcome our trigger points and enact long-term change. Goldsmith believes that our environment holds us back from changing our behaviours through triggering old behaviours, the key being to create new triggers. I was particularly interested in his discussion around awareness of our triggers. Through trigger awareness we have a chance to anticipate and avoid our old triggers. This is a great skill that is useful in developing our cultural intelligence and changing our unconscious and conscious bias behaviours. The book offers some great personal development questions, while encouraging the reader to take an active role in changing many aspects of their lives, not just their professional lives. We are excited to announce that we now have 'The Invisible Elephant: Exploring Cultural Awareness' in ebook format and have a simplified Chinese version available.